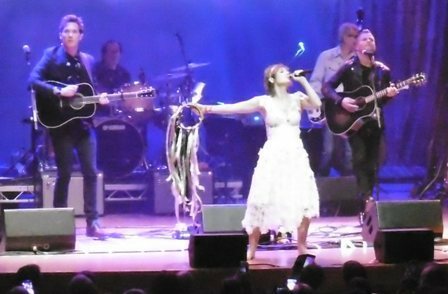 Birmingham got a flavour of the Grand Ole Opry as stars of hit TV series Nashville performed in concert on their first UK tour. 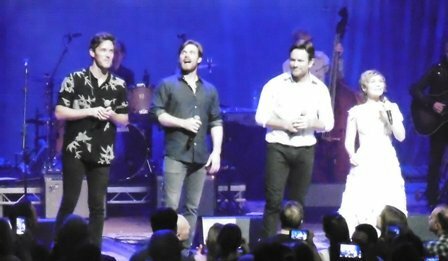 Clare Bowen, Chris Carmack, Charles Esten and Sam Palladio showed they could sing as well as act, powering through two and half hours of country, rock and blues, backed by a great five-piece band. The songs were a mix of tunes from the show (series four is set to air on Sky Living in August), a handful of covers and a good number of original numbers as heard on the artists' solo EPs and albums. The capacity audience whooped it up, building a rapport with the performers but often leaving them unsure how to respond to the good natured comments being hollered at them. Perhaps British fans are more enthusiastic than Americans. 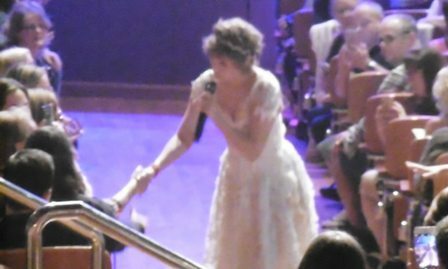 Charles Esten (Deacon Claybourne in Nashville) and Clare Bowen (Scarlett O'Connor) decided they needed to get closer to the crowd, taking walkabouts in the audience during a couple of songs. Clare even gave one lady her tiara. For the first four songs of the gig each singer performed solo. 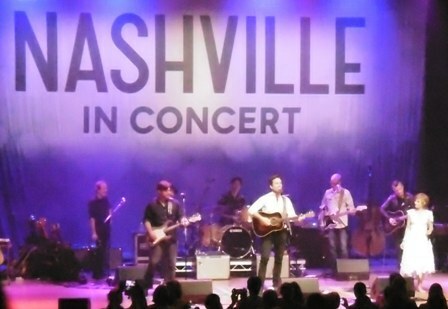 Chris Carmack (Will Lexington) showcased What If I Was Willing, Sam Palladio (Gunnar Scott) sang country ballad Can't Get It Right, Clare Bowen, looking like a barefoot princess, introduced her guitarist fiancé Brandon Young for Stay A Little Longer and Charles Esten appeared to a great ovation for I Know How To Love You Now. 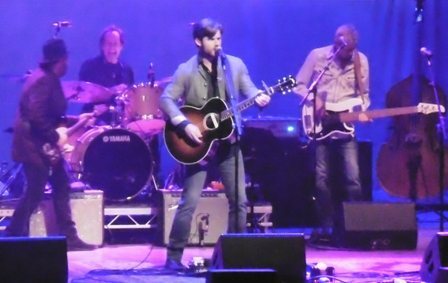 Penzance-born Sam Palladio joined him for the rocking Heading For The Fire, then Sam previewed a song from season four, You Can Count On Me. As Clare Bowen duetted with Sam on This Is Where I Belong, playing a tambourine bedecked with flowing ribbons, I realised she reminded me of a country version of Fleetwood Mac's Stevie Nicks. Chris played a mean saxophone as she continued with one of her own songs, Premonition, written for her mother. Charles brought the first half to an end with a couple of songs, including one of the show's highlights, a bluesy So I Cry, and a foray into the audience. The first half proved to be just a taster for a terrific second half which the performers, and audience, didn't want to end. There were duets aplenty and some truly unforgettable moments. 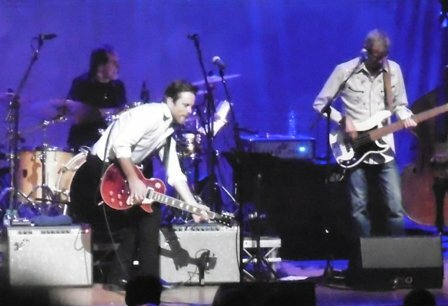 Chris Carmack's cover of BB King's Sweet Little Angel, featuring resident Nashville guitarist Colin Linden, just about took the roof off Symphony Hall, while Charles' and Clare's version of Elvis' That's Alright (Mama) introduced some vintage rock 'n' roll. 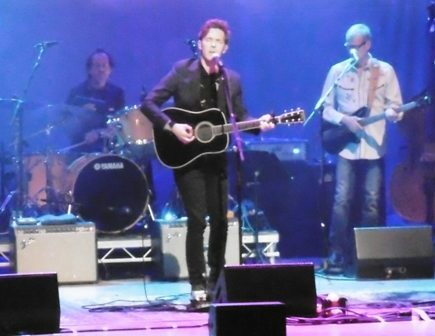 Country music is all about emotion so when the only Brit of the quartet, Sam Palladio, said his family was in the audience he got a huge cheer. But we were unprepared for what happened next. He performed Wake Me Up In Nashville, a song inspired by his grandpa's romance with an American girl in World War II. Afterwards he said he'd always wanted his granddad, a World War II air force hero, to see him perform the song – and tonight that's what happened. 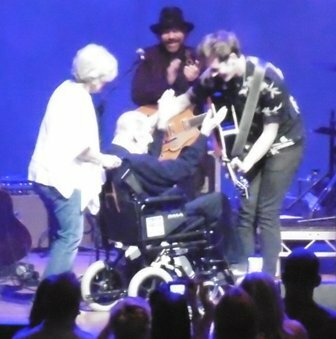 Grandpa, in a wheelchair, came on stage and the audience gave him a standing ovation. Could that tear-jerker be topped? Only by Clare Bowen who sobbed after singing Love Steps In, dedicated to her cancer-suffering brother, for whom she had recently donated bone marrow. After all that emotion, the show was concluded by Charles who had everyone on their feet for He Ain't Me before being joined by his colleagues for Then We're Gone and an encore of A Life That's Good. If this concert was a box set I'd watch it all over again immediately. June 18 & 19: Eventim Apollo, London.